The RFID ICs harvest energy from the RF field created by RFID readers and use that power to drive sensors, actuators or other electronics effectively creating battery-free devices. All commands used with these ICs are standard, no custom commands are needed. 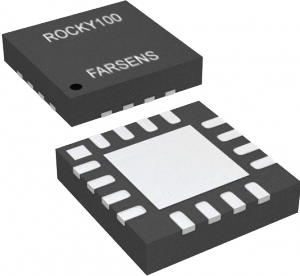 The Rocky100 is a UHF RFID chip to develop battery free sensor tags. The chip is configurable to allow for the development of multiple solutions without having to work with different chips. It includes advantages such as a dynamic configuration of Master or Slave SPI port for communication with external devices, configurable output power from 1.2V to 3.0V to supply those devices or the battery assisted passive – BAP – function.